UPDATE (5/14/12): As Topps begins to process wrapper redemption requests, they expect to have their stock of 10,000 packs gone by Wednesday. In a statement, they said they should have enough packs for requests received by May 14th and, likely, the 15th. Beyond that, they suspect their inventory will be gone. Topps has announced a 2012 Bowman Baseball wrapper redemption program. 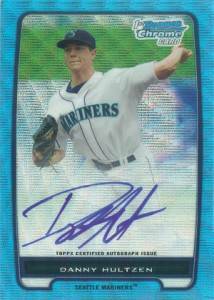 It features exclusive Blue Wave Refractors. 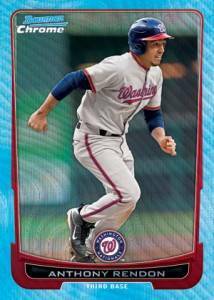 For every 24 hobby wrappers or seven jumbo wrappers from 2012 Bowman Baseball collectors send in, they will receive a five-card pack of the new Blue Wave Refractors. A total of 110 cards make up the set. 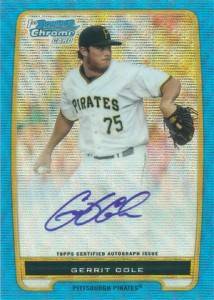 Topps is also including random autographs from such prospects as Gerrit Cole, Josh Bell, Matt Purke, Danny Hultzen and Dante Bichette Jr.
Topps is limiting the print run of the 2012 Bowman Baseball wrapper redemption packs to 10,000. Packs will be given out on a first-come, first-served basis. The company also pledged to give collectors regular updates via Twitter (@toppscards) to keep collectors up-to-date. Topps' last wrapper redemption program, found in 2012 Topps Series 1 Baseball, was popular with collectors. The company quickly ran out of their supply of exclusive Gold Rush cards. I feel REALLY badly for those (including myself) who have just purchased a pile of those wrappers off eBay and will most likely not receive their packs. I don’t know what else to say, except that I hope there can be some kind of compensation. RS (ID 42113) � It is unfortunate, however it was something of a risk. Topps was up front in saying there were a specific number of packs ahead of time. I did notice some tweaks done from the 2012 Topps Series 1 Gold Rush redemptions, namely more advance communication. Perhaps the next tweak would be limiting the number of redemption packs per household, at least for the first period of time.